We handle customer service a little differently at Network Health. Our health care concierge team provides solutions to your concerns, and best of all—they are just a phone call away at 800-378-5234 (TTY 800-947-3529) Monday–Friday, from 8 a.m. to 8 p.m. October 1–March 31, they’re here every day, from 8 a.m. to 8 p.m. Or, if you’d prefer, you can stop into our Menasha office and speak face-to-face. Here's your chance to meet our team of caring and knowledgeable professionals who get your questions answered quickly and treat you with courtesy and respect. Click here to meet the team. As a member, you can make changes to your plan in the following situations. It's during the annual enrollment period (October 15–December 7). You lose coverage through your employer. You move outside of your plan’s service area. Your current Medicare Advantage plan is discontinued. Your income has changed and you now qualify for Extra Help. Network Health offers ticket discounts for select performances at these venues. 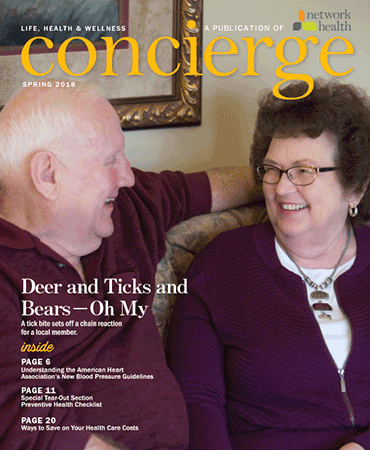 Offers are highlighted in Network Health’s Concierge member newsletter. THE PLAY THAT GOES WRONG – May 5 at 1 p.m. Priority Seating – Tickets on sale now. Offer expires April 22, 2019. Subject to availability. Visit www.foxcitiespac.com/onlineoffers select Network Health Medicare Advantage Plan Member and use promo code MEDICARE when purchasing tickets. GLENN MILLER ORCHESTRA – May 24 at 7:30 p.m. Priority Seating – Tickets on sale now. Offer expires May 23, 2019. Subject to availability. ANASTASIA – July 28 at 1 p.m. Priority Seating – Tickets on sale now. Offer expires July 19, 2019. Subject to availability. Visit www.marcuscenter.org/mcaccess and either login or create an account using the Group Code: network. Each year, Network Health hosts special events throughout our service area, called Experience Network Health. We invite you to learn about your plan and any upcoming changes for next year. We give benefit presentations, provide materials and resources and you can get your annual flu shot. Plus, you're welcome to bring a friend. Watch for your invitation to arrive in September. Reservations are recommended. Our Medicare Advantage member newsletter, Concierge, includes helpful tips and advice for your life, health and wellness as well as a member feature story. You’ll also find highlights on the best ways to use your plan, save money and get the most from your coverage. As a member, you also have access to lots of programs to help you stay well. Because we care about your well-being, these programs are available at no cost. One-on-one support to help you achieve and maintain a healthy lifestyle. Support for our members that are dealing with a short-term illness or a more complex medical condition. One-on-one health coaching is available at no cost for our members with a chronic condition (asthma, chronic obstructive pulmonary disease (COPD), diabetes, heart disease, stroke or heart failure). Available workshops to teach members how to best manage common symptoms of chronic conditions. A proactive program designed to help members with chronic bronchitis, emphysema and chronic obstructive pulmonary disease (COPD) avoid flare-ups, control symptoms and potentially improve their lung conditions. This program helps you and your doctor ensure your medications are working to improve your health. Set up recurring premium payments for the year using your bank account or credit card. This form names a relative, friend, advocate, doctor or someone else to act on your behalf for an appeal or complaint. 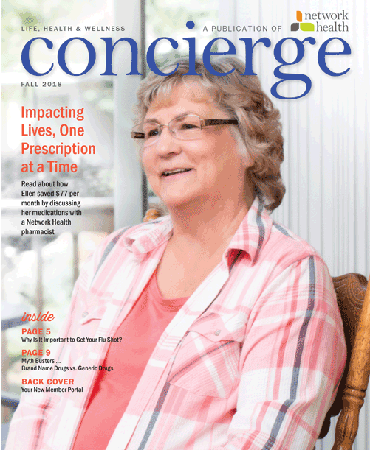 Send the completed form to Network Health, Attn: Medicare Advantage Plans, PO Box 120, Menasha, WI 54952. Sign up for convenient home delivery of your prescriptions. This form initiates the appeal process on your behalf, asking Network Health to consider a coverage or benefit decision that has been made. The use of this form ensures complete information is sent to Network Health for timely and accurate processing of your appeal request. If a provider is unable to send a claim this form can be used to submit charges to Network Health. his form allows a specified person (a spouse, relative, friend, advocate, attorney, doctor or someone else) to call to discuss your coverage and plan information if it’s ever needed. To request reimbursement for a self-administered drug, use this form. Use this form to keep track of your preventive care and screenings. You have the right to request coverage for a particular prescription drug. You have the right to ask us to reconsider a coverage decision made for a particular prescription drug. Tips, contact numbers and what you should know about Medicare and billing fraud. Visit this page for our clinical practice guidelines that include U.S. Preventive Services Task Force recommendations for preventive care, like certain screenings, shots and vaccines that can help you stay healthy and avoid getting sick. Find all of our Medicare processes, policies and procedures in one reference manual. For accommodations of persons with special needs at meetings call 800-378-5234 (TTY 800-947-3529).